Larry passed away several months ago. Cancer caught up with him in his mid-seventies. He didn’t survive the surgery. He is now with his Lord. I knew Larry for a couple of years. We shared the same table at our Tuesday morning small group. His life is like many of us. We could write a book or do a movie about him and it would probably be a top seller. He served in the arm forces; was a successful general contractor, and with his bride raised a couple of daughters. But more importantly, his testimony was written in his actions each and every day. He walk the talk. He didn’t surrender to our Lord until about a year after he joined our small group. He was then baptized and enthusiastically put his faith into action wherever he went. He wasn’t born with a glib to speak. He was introverted. But volunteered to lead and preach in a small venue for senior citizens of an independent living community. I’m sure it made him feel younger. But more importantly, his congregation loved him and he them. He wasn’t highly educated in a formal setting. But had more common sense than most. He couldn’t read enough about Jesus, His Kingdom, and the power of the Holy Spirit. And whenever something he read moved him, he would make copies and share it with whomever he met. He wasn’t bashful. He loved to pick up the check at restaurants without any fanfare or recognition. He simply enjoyed making people happy without having to be noticed. He would volunteer without being asked to help someone who needed carpentry work done. He knew his limitations yet didn’t let that get into his way. He simply trusted Jesus. Paul wrote in Philippians that we need to keep our eyes on those who truly live out their faith. 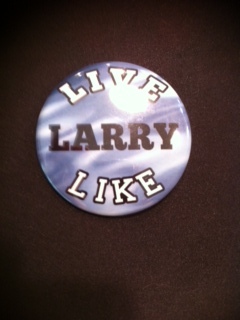 Therefore, one of the men in our small group had these buttons made with the caption “Live Like Larry.” It’s our way to pay tribute to a man who walk the talk. How many Larry’s do you know?